What better way to spend a cold, snowy February day reading McCann’s book while listening to the classic album that help define the bossa nova sound of the early 1960s. 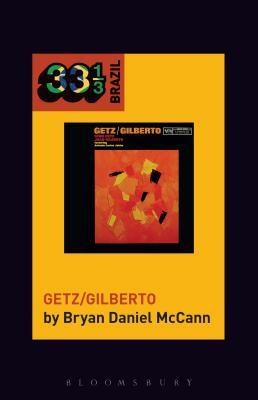 Part of the terrific 33 1/3 series that explores in depth seminal recordings of many different genres, this volume places the Getz/Gilberto album in social, historical, and musical context along with expert discussions of each composition cut by cut. Most die-hard Brazilian music fans would argue that Getz/Gilberto, the iconic 1964 album featuring "The Girl from Ipanema," is not the best bossa nova record. Yet we've all heard "The Girl from Ipanema" as background music in a thousand anodyne settings, from cocktail parties to telephone hold music. So how did Getz/Gilberto become the Brazilian album known around the world, crossing generational and demographic divides? Bryan McCann traces the history and making of Getz/Gilberto as a musical collaboration between leading figure of bossa nova Jo o Gilberto and Philadelphia-born and New York-raised cool jazz artist Stan Getz. McCann also reveals the contributions of the less-understood participants (Astrud Gilberto's unrehearsed, English-language vocals; Creed Taylor's immaculate production; Olga Albizu's arresting, abstract-expressionist cover art) to show how a perfect balance of talents led to not just a great album, but a global pop sensation. And he explains how Getz/Gilberto emerged from the context of Bossa Nova Rio de Janeiro, the brief period when the subtle harmonies and aching melodies of bossa nova seemed to distill the spirit of a modernizing, sensuous city. 33 1/3 Global, a series related to but independent from 33 1/3, takes the format of the original series of short, music-based books and brings the focus to music throughout the world. With initial volumes focusing on Japanese and Brazilian music, the series will also include volumes on the popular music of Australia/Oceania, Europe, Africa, the Middle East, and more. Bryan McCann is Professor of Brazilian History at Georgetown University, USA.